The cup presented to Spyros Louis, winner of the first marathon of the modern Olympic Games, has been sold for more than half a million pounds ($800,000/€611,000) at Christie’s recently—a world record price for Olympic memorabilia at auction. 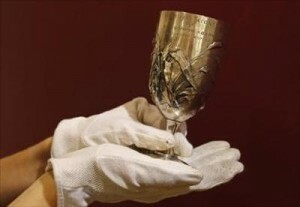 The Bréal's Silver Cup won by Spyros Louis in 1896. The Bréal’s Silver Cup, won by Louis at the inaugural Games in Athens in 1896, fetched a top bid of £541,250 ($867,266/€661,171) in the London saleroom and was acquired by the Stavros Niarchos Foundation to be shared with the Greek people. The sale price was around four times the estimated price of the cup, which had been valued at between £120,000 ($192,000/€147,000) and £160,000 ($256,000/€195,000). The cup will be on permanent public display at the Stavros Niarchos Foundation Cultural Centre in Athens upon the building’s completion in 2015. In the interim, the organization will work to find a suitable and temporary location for display. Presented at auction for the first time, the unique cup, which stands at only six inches (15 centimeters) high, was offered for sale by the grandson and namesake of the famous Greek athlete, who died in 1940 at age 67. The auction as a whole—on the theme of Vintage Posters and Olympic Icons—realized a total of £1,260,275 ($2,019,010.45/€1,539,132.43). Further Olympic highlights from the sale included a vintage poster advertising travel to the first London Games in 1908, which sold for £15,000 ($24,000/€18,000), the Harold Abrahams Collection of memorabilia dating from 1911 to 1924, which fetched £39,650 ($67,531/€48,416) and an Olympic Torch from 1948, which brought in £6,250 ($10,014/€7,632). Contact the writer of this story at mike.rowbottom@insidethegames.biz. Insidethegames.biz is an online blog of the organizing committee for the Summer Olympics to be held later this year in London. This article is reprinted with permission.